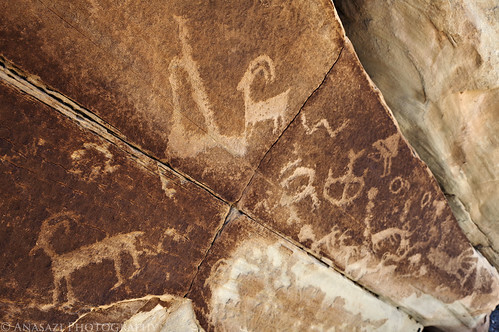 45 Degree Rock is a well-known panel located at the base of Cedar Mountain in the San Rafael Swell. Most photos I have seen of this panel are of the complete boulder that they are located on, which sticks out of the ground at approximately a 45 degree angle. I went for a little different perspective here looking down the face of the rock. If you look closely, you can find the small hunched-over figure that appears to have a burden basket on it’s back.